Happy New Year to everyone! I hope folks are taking it easy and not too tired or hung-over from last night’s fun, if you participated. Any New Year’s resolutions among my readers? Mine is to try to be more organized and on top of things this year. Tied into that is a desire to break this terrible habit of procrastination that I have. Also a few other habit-related goals. Breaking habits are some of the worst sorts of resolutions because they can be so hard to follow through on and then continue with, but hope springs eternal, and at this time of year, the springs are probably at their highest. I’ve only been to one or two New Year’s parties over the years, preferring instead to spend it quietly with loved ones at home, and so last night found Dan and I curled up on the couch, watching some programs on TV and generally having a relaxing evening. Today my parents came by for a holidays visit, which was also nice. It has been a couple months since they were last up, they haven’t been by since they bought their new home (the primary reason they were up this way so frequently before was because of the house search, and the length of the drive from their old home). We all went out together to take Raven for her daily walk (she was a bundle of excited energy over the arrival of visitors), and I took them down the road to my favourite property. I didn’t take any photos today, these are from a visit a few weeks back, when the snow cover wasn’t quite as deep. Speaking of springs, I discovered this one on the property, just another reason I’m so taken with the place. I had followed the little creek back along its length upstream to find its source, since I knew the water didn’t cross the driveway anywhere, Sure enough, the stream seemed to emanate from the tangled roots of two large birch trees. I couldn’t see the water’s source itself, the hollows under the arching roots too dark to discern anything. The flow was strong enough that the source had to be more than just a seep in the rock bed. There are three primary types of springs. The first, the one that most people have probably seen at some point, is a seep. 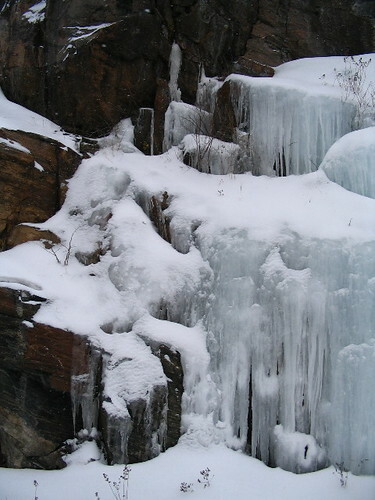 Seeps are responsible for forming these sorts of icicle formations on the sides of rock walls or cliffs. They can be found occurring naturally, but just as often are the result of human activity, frequently the excavation of rock hummocks or ridges to allow the passage of roadways. More often than not when I pass a rock cliff along the highway during the winter it has at least a few icicle formations flowing from it. Seeps are the result of water flowing between rock layers, or through the gaps in porous rock, under the surface of the ground. When the water comes to a spot where the rock has been sheared away or otherwise exposed the water flows down along the rock face or pools on the ground, often creating a small creek. The second results when the landscape is composed of rock, such as limestone, that is very susceptible to erosion, and over (a very long) time a network of holes and tunnels develop through the ground. 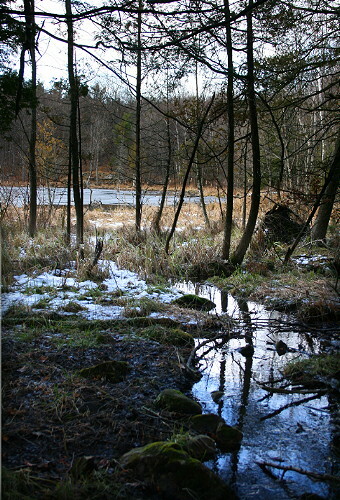 Water flowing from one source may encounter a sinkhole, a spot where erosion has formed a tunnel through the ground, and the stream seems to disappear. The tunnel ends further along in the landscape, where the stream pops back to the surface and continues on. Such landscapes are called Karst landscapes, or Karst formations. The third is the sort I suspect to be the case here, given that most of the rock in the area is granite, and is where water is actually forced by pressure upwards through a hole in the ground. If the pressure is constant, the water on the surface can’t flow back down through the hole, and ends up pooling around it. 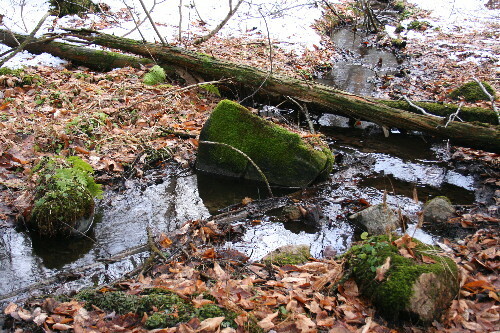 Some water will inevitably trickle back down through the soil, but if the pool basin is mostly rock, or if the rate of water being pushed out of the hole is greater than what can seep through the soil, the water will eventually overflow the basin’s edges and start off downhill, forming a small creek or stream. What sort of pressure can cause groundwater to be forced upwards to the surface? There are two possible causes. The first is if the well goes down to an aquifer that is completely contained within bedrock walls. The pressure from the surrounding rock pressing in on the water will push it up through the hole, even though it’s against gravity. The other cause is a function of topography. In an area where the geology includes a layer of porous rock bookended above and below by dense, impermeable rock like granite or clay, a pool of water may collect in the porous layer if the ground level rises to each side. Water that trickled through the soil in the higher areas will flow through the porous layer and result in an aquifer in the depression in the middle. If it fills up enough such that the water level at the sides, where the porous rock layer curves upward, is higher than the ground surface in the middle, then there will be enough pressure from the surrounding water to push the stuff in the depression up through a hole or well that forms in the surface. 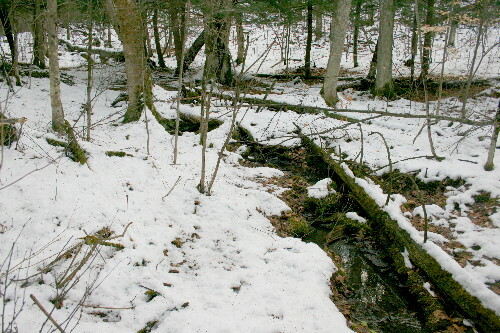 This sort of spring is called an artesian spring (and the aquifer an artesian aquifer), named after the former province of Artois, France, where the first such wells were originally used. Confused? Try imagining taking a colander and duct-taping up all but one hole at the bottom. Push it into a sink full of water, just so that the edges are still slightly above the surface, but the bottom of the bowl is well below the surface level. Water will quickly begin rushing up through the hole in the bottom of the colander because of the pressure being exerted from the water in the rest of the sink, even though it’s moving in a direction opposite to gravity. The duct-tape is probably not completely sealed, though, and I bet you see trickles coming out from the edges. These are like seeps, where the groundwater meets a hole in a vertical rock surface. Springs can be classified by order of magnitude. The biggest springs, with the label 1st Magnitude, are ones that produce in excess of 100 cubic feet per second (2800 cubic litres per second) at their source. They decrease, as the system suggests, approximately by orders of magnitude (2nd is 10 to 100 ft3/s, for instance, and 3rd is 1 to 10 ft3/s), down to the 9th Magnitude, which is less than 1 pint/minute (8 mL/s). Without having an actual tool to measure the flow of water in the little creek, I would estimate it to be a 5th magnitude spring – one that produces water at a rate of about 10 to 100 gallons per minute (0.63 to 6.3 L/s). It moved along at a reasonable rate for its size, certainly at least a litre per second, probably more. The water wound its way through the forest, the narrow stream bed bordered by hemlocks, Yellow Birch and other trees that enjoy moist soil, and emptied out into a small wetland that bordered the edge of the lake. 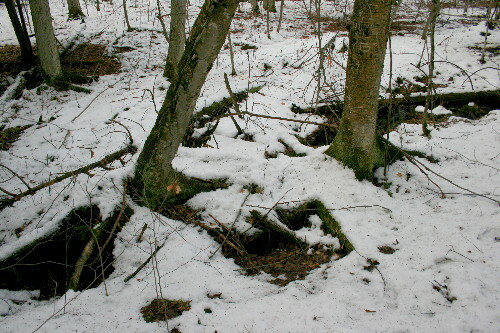 I’ve found a few springs in our area, but this one is my favourite, both because of the mystery behind the origin of the water, hidden as it is beneath the roots of the birches, and because of the surroundings the little creek passes through and ends at. Great information…I used to have a cabin in vermont..on the property we had a spring…dont know what kind it was…but we had nice fresh water from it. Thanks for this great explanation. 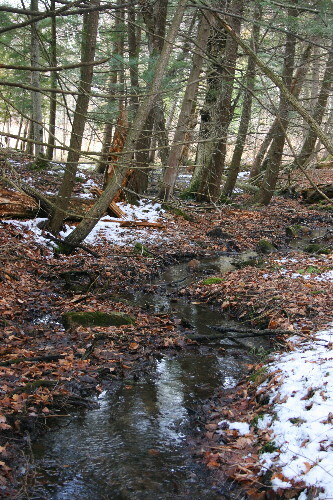 I have encountered many of these springs on my hikes through the Escarpment and didn’t know where they came from. I will keep my eyes open and investigate next time. I discovered your blog through the festival of trees. I enjoyed your story about your Christmas tree adventure. Thanks, Dawn. I haven’t been tempted to try the water from our springs, but it’s probably nice and fresh, too. Glad to have you stop by, Avery! The escarpment is beautiful, especially the areas with water features.